Lysosomal storage diseases (LSDs) are some of the most challenging disorders facing patients and clinicians. Fortunately, the Lysosomal Disorders Center at Cooper – the only resource of its kind in South Jersey – provides diagnostic evaluation, multispecialty care, and management of both adults and children with these disorders in a single, convenient location. Jaya Ganesh, MD Associate Professor, Division of Genetics, Children’s Regional Hospital at Cooper. 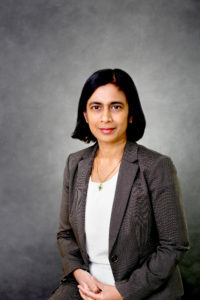 “Lysosomal storage diseases are a group of about 50 rare, inherited metabolic disorders caused by missing or poorly functioning enzymes,” explains Jaya Ganesh, MD, Associate Professor in the Division of Genetics at Children’s Regional Hospital at Cooper, referring to the enzymes within lysosomes that digest large molecules and pass the fragments on to other parts of the cell for recycling. LSDs have an estimated combined incidence of 1 in 5,000 to 1 in 10,000 live births. Until the early nineties, treatment was limited to symptom management and supportive care. In 1991, however, enzyme replacement therapy (ERT) became available for Type I Gaucher disease, one of the more common LSDs. Since then, ERT has become available for other LSDs including Fabry disease, Pompe disease, mucopolysaccharidosis Types I, II, IV and VI, and lysosomal acid lipase deficiency. This underscores the importance of having an easily accessible facility for patients and families affected by LSDs. Before the Lysosomal program began in 2015, patients had to travel long distances and sometimes out of state to obtain the comprehensive care they require. ERT is initially administered onsite at Cooper’s Short Procedure Unit (SPU). Once they are stable, patients are transitioned to home infusions while continuing to receive multispecialty care from the team of geneticists, neurologists, nephrologists, cardiologists, and other subspecialists specially trained in LSD care. The multidisciplinary team also includes nurses, physical therapists, and pharmacists. Comprehensive genetic counseling is provided for affected families. “While there currently is no cure for LSDs, ERT can relieve disease-specific symptoms, improve organ function, prevent ongoing damage, and improve overall quality of life for affected patients,” she adds. Notably, newborn screening for several LSDs is slated to launch in New Jersey in 2017. The Lysosomal Disorders Center will provide comprehensive care for these babies and their families. In addition, the Center’s participating faculty and staff participate in international collaborative lysosomal disease registry programs—longitudinal, observational databases that track outcomes of routine clinical care for this patient population. “We’re hopeful that this data will provide information to facilitate development of more targeted therapies in the future,” Dr. Ganesh says. “Plus, several novel treatments including use of molecular chaperones and substrate inhibition therapy are currently under development. both children and adults can access its services. To schedule an appointment or speak with a member of the Lysosomal Disorders Center, please call 856.968.7255.